The 1T-MX-6344 4x4 HDMI matrix switcher allows distribution of four HDMI sources independently to four destinations. It supports HDMI v1.3 Deep Colorvideo and new lossless, compressed Dolby TrueHD, Dolby Digital Plus, as well as DTS-HD Master Audio digital audio. HDCP is supported and all signal paths are fully buffered to prevent cross talk. Frequency bandwidth is 2.25 Gbps and each input signal is reconstituted into a new signal before being output thereby eliminating any jitter component. HDTV signals up to 1080p and PC signals up to UXGA signals are supported as well as 480i and 576i SDTV. The SMX System MultiMatrix combines multiple, independent analog and digital matrix switchers in a modular enclosure system. SMX frames are available in sizes from 2U up to 5U, capable of supporting up to 10 separate matrix boards, which can be switched independently or simultaneously, all under a single point of control. The heart of the SMX System MultiMatrix is a frame designed to facilitate the installation of new and replacement matrix switcher boards with a minimum of time and labor. The hot-swappable card-cage design quickly aligns each matrix board on its own horizontal plane. Matrix boards can be installed without switcher disassembly, new firmware, or even the need to remove a previously-installed SMX switcher from the rack. To complement the 32X32 Wideband Analog router introduced earlier this year, Utah Scientific has now added an HD/SD version, the UTAH100/ X32HD. The latest router in the UTAH-100 series shares the same quality specifications as the smaller 8X8 and 16X16 configurations, including equalization, reclocking, and 3Gbps capability. The router is housed in a compact 2RU frame and available with a choice of front-mounted or remote control panels. Like all of the other routers in the UTAH-100 family, the new routers can be controlled through both ethernet and RS-232 serial interfaces. Atlona Technologies’ PROHD1616M- SR is a solution for installers looking to send and switch between multiple HD sources and multiple HD displays. This HDMI1.3 matrix switcher is a 16x16:2 HDMI matrix switch featuring 16 HDMI 1.3 inputs, and 16 independently switchable HDMI and twisted pair outputs to feed 16 separate displays simultaneously. With seven means of control, including IR remote, this unit can send sources such as DVD players, Blu-ray, PS3, Xbox 360, or any other HDMI devices remotely or directly from the location of that HD display. With a seven-inch LCD panel, installers can preview all signal as well as monitor the output sources. The Cheetah-3 is a compact 3G-SDI fiber optic routers offering 144X144 in only 4RU. PESA’s Cheetah-3 starts at 36X36 with the flexibility to expand up to 144X144 without the need for additional rack space or power supplies. A frame consumes about half the power of a similar frame size, reducing the cost of total ownership over the life of the product. Systems can be setup to support a wide range of serial digital transports including SMPTE 259M, 292M, and 424M. The user selectable format by-pass feature allows data rates from 143 Mbps up to 3 Gbps. The Epica DGX 16 Fiber Matrix Switcher is the newest member of the Epica DGX family offering installers a more compact solution while providing the same performance and support like the Smart- Scale technology. SmartScale works by automatically responding to a display’s declared EDID information then optimizing the video resolution and video parameters independently for each display throughout a deployment. As fiber is becoming more widely installed, the DGX 16 provides a platform to take advantage of higher-bandwidth and deliver many combinations of DVI, RGBHV, HDMI, audio, and one-way RS-232 control signals up to 3,000 feet. 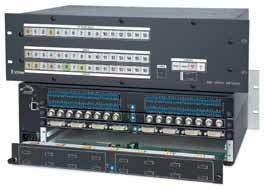 The EOS-4000 Series of electro-optical routing switchers are multipurpose, nonblocking, transparent switchers that provide high-speed switching between ports with minimal effect on overall network latency. The EOS-4000 series is capable of switching digital optical signals of up to 4.25Gbps via SFP and up to 10 Gbps via XFP. Fiber optic transport systems from MultiDyne today support transport rates up to 4.25Gbps. There is an engineering road map for fiber transport systems that will support 10Gbps in the future. The EOS-4000 is scalable in size and scalable in bandwidth to support future 10 Gbps technology in the future. The EOS-4000 is designed to accept a 4.25 Gbps modular IO interface blades with up to 16 SFP small form-factor pluggable transceiver modules per blade. Each SFP transceiver module provides the physical ports for one input-output pair. RGB Spectrum’s Linx Prime CrossXFormat switchers accept multiple input formats and convert analog and SDI signals to DVI. They also offer copper-to-optical and optical-tocopper conversion, requiring only a single strand of fiber for video plus real time EDID and HDCP. All DVI-capable cards are HDCP compliant and pass HDMI signals, including audio. With their modular architecture, the switchers are configurable with any combination of two-channel input and output card types. Input cards include DVI/ HDMI, DVI over fiber, analog RGB/YPbPr, and HD/3G-SDI signals. Outputs cards are DVI/HDMI, available with or without scaling, and DVI over fiber. Scaling synchronizes outputs, creating seamless switching. The DM-MD32X32 DigitalMedia Switcher a source-to-display, high-definition signal management solution that distributes and manages all analog and uncompressed HD digital signals over a single copper wire and fiber. The DM-MD32X32 distributes any mix of composite, component, S-video, VGA, HD-SDI, HDMI with HDCP, DVI, DisplayPort, ethernet, and USB keyboard/ mouse control, up to 1,000 feet using a single DM cable or CresFIBER. The DM-MD32X32 seamlessly manages HDCP content protection, EDID resolution management and CEC device control ensuring lossless signal distribution of protected HD content. Exclusive QuickSwitch HD pre-authorizes HDCP keys for fast, uninterrupted HD switching. The Draco major switch from IHSE is available in available in Cat-X, multimode, or singlemode. DVI sources, whether connected via fiber or Cat-X can be switched through the matrix. Up to 16 users and 32 sources can be used. KVM supports follow- me mode to allow user to setup other displays to follow on-screen images when active or switched. There is also user management and access right management in up to 1000 levels. The Draco Major features seamless integration with Crestron and AMX controllers. The Key Digital KD-HDMS4x4 HDMI matrix switcher is capable of up to four HDMI/ DVI sources to four independent outputs via both HDMI and Cat-5. The KD-HDMS 4x4, now in production combines HDMI and Cat-5 inputs and outputs using versatile card slot architecture. Each card supports HDMI, Cat-5, analog or digital audio, RS-232, and IR control. An internal EDID library features six default EDID configurations as well as the ability to copy EDID information from any display to any output. This unit provides video, audio, bi-directional IR, and RS-232 over a single Cat-5 cable when paired with the KD-BBRX Balun.